Ile Fourchue, St. Barths. What a great setting! Maria walking the docks in Simpson Bay Maria. There are lots of fellow sailors to visit here! 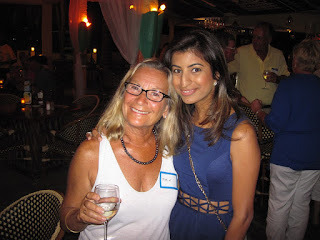 Maria and Deepti, her favorite jeweler, and always trouble for Captain Steve when they get together. 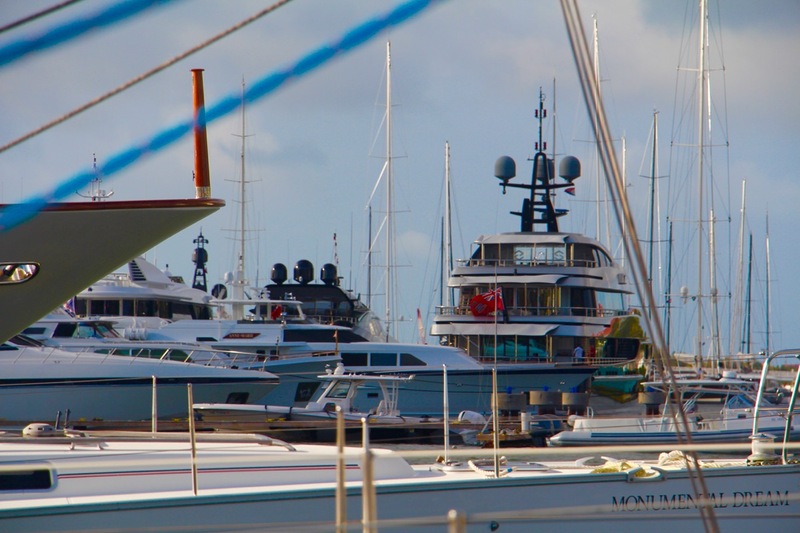 Just a view of the mega-yachts from Aspen's deck in Sint Maarten. Maria after a visit to the hair salon on Sint Maarten. Two of our sailing friends, Don and Donna on Destiny, invited us to enjoy St. Patrick’s Day at the villa they built with spectacular views of St Baths in the distance. Wow. 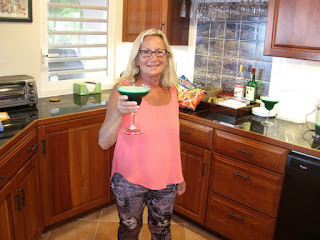 Green margaritas on St. Patrick's Day of course! 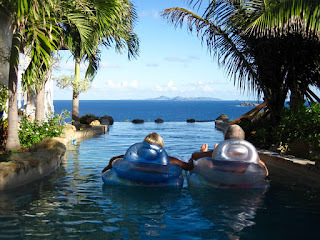 Two wayward sailors, Maria and Captain Steve, floating in the villa's fantastic pool. Lots of anchored boats in Grand Case, French St. Martin for the Tuesday night street party. 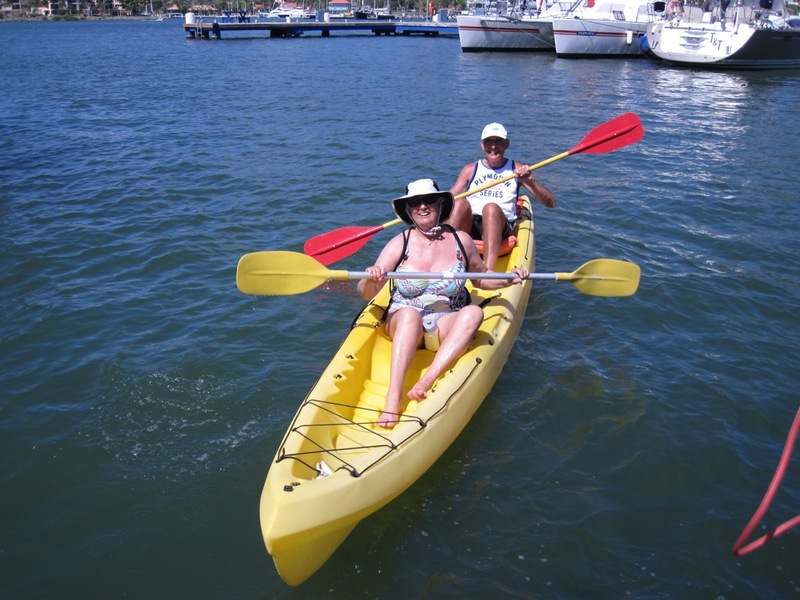 Another set of friends from Holland (Jan and Ida) paddled by Aspen for a visit as well. Steve's running friend Jan from Holland. 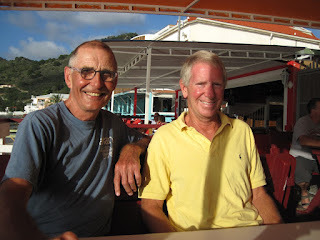 We have been running together since 1996 on Sint Maarten. 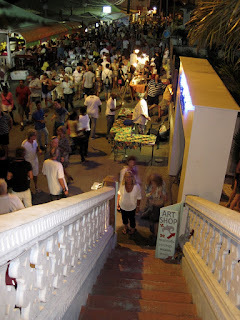 Maria at the Tuesday street party in Grand Case, St. Martin. It was pretty crowded! It was a lovely sail from Antigua to Ile Fourchue, off the coast of St. Barts. 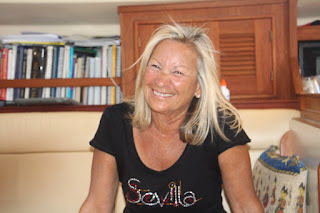 We arrived in daylight and the entrance was easy and welcoming after 15 hours at sea. 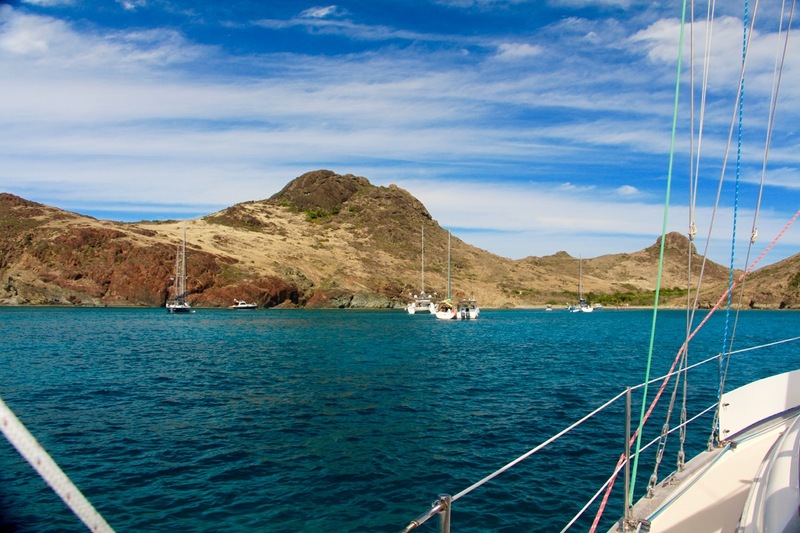 Ile Fourchue is uninhabited and a national park for St. Barts. If the once present goats had not eaten all the vegetation they might still be alive to enjoy the stark setting. But such is not the case for the goats. Instead we discovered an ancient caldera, blown apart on the west side so many million years ago. One part of the high crater rim is still present and my running was like being on a lunar landscape. What fun that was. 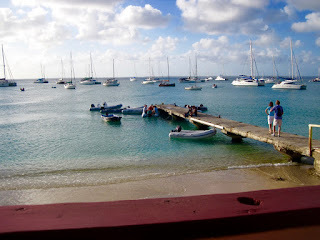 Leaving Ile Fourchue it was only a 3 hour sail to our favorite island, Sint Maarten. It felt like we were coming home as we motored through the bridge and into Simpson Bay Lagoon, Sint Maarten. 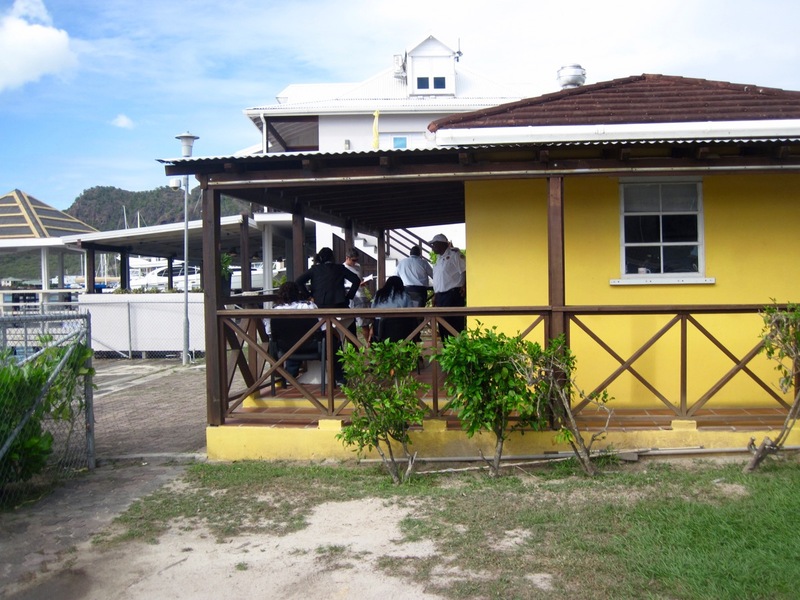 We have lived on Sint Maarten, partied here, made lots of lasting friends and of course anchored Aspen among the thriving yet friendly island. 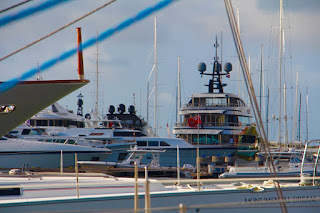 Where else can you have happy hour beside the bridge and watch multi-million dollar mega-yachts float into the Lagoon mere feet from your rum punch? The rich of the rich come here on their vessels, as do the beautiful people but no one really cares who they are. Sailors love to look at their magnificent ships, enormous sailboats and all the toys they store on deck as they parade slowly by. If you have a couple hundred million dollars (US currency of course) you too can become part of the parade. Aspen led one regal procession through the bridge and into the Lagoon even though Captain Steve hates to be first though the bridge, just in case something goes wrong as has happened before. But this time it was fun waving to everyone gathered at the bar before finding a safe shelter inside. Now it is time to relax and recharge, both Aspen and ourselves. Maria was enjoying some great R&R with a hair appointment, nails done, a visit with her favorite jewelers (Deepti and Kamal) and even has managed to fit in a massage. While Maria got pampered, Captain Steve changed the depth sounder, replaced the main battery bank, installed a new water maker pump, fixed the wind generator, worked on the refrigeration and only managed to smash 2 fingers in the process. Ah but they will heal, he was heard saying. We’ve posted some pictures of our social activities on the blog site too. 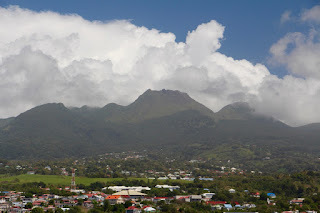 The volcano on Guadeloupe with the cone free of clouds. This is a huge volcano and still active at times. The customs officials in Jolly Harbour, Antigua. Lots of movement and stamping of papers. 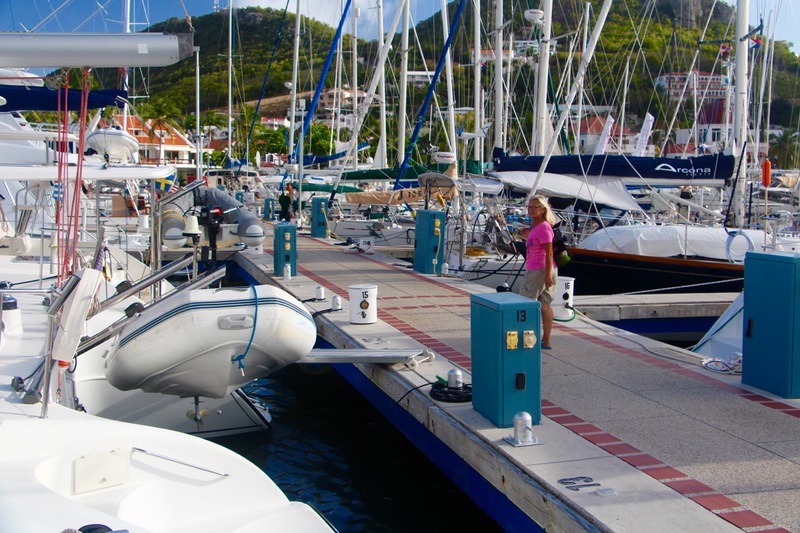 Jolly Harbour Marina and the nice docks (with power too). Great Bird Island and some picnic tables slowly sinking into the sand. 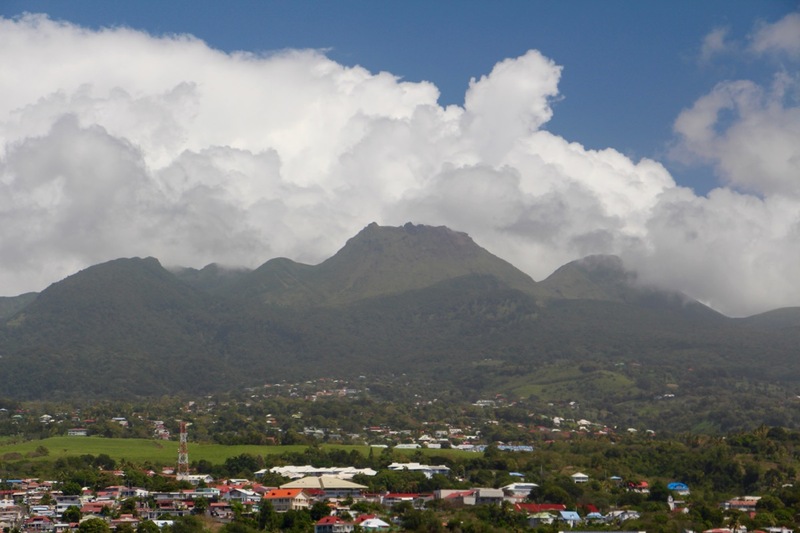 The winds of March blew Aspen from Guadeloupe to Antigua, another x-British island sitting in an emerald sea. Along the way we passed the active volcano on Montserrat before making landfall in Jolly Harbour and meeting with the customs officials. We got lucky and found the required quarantine dock free of boats so Maria only had to jump off Aspen and quickly tie our lines before we drifted away. Maria doesn’t like jumping from a moving boat so with a lot of coaxing from Captain Steve, she managed the 1-foot leap without making a splash in the bay. Maria seemed happy with her jump as well, reminding the Captain that her legs are not as long as his. It only took two days to stock up on vegetables, food, a cheap digital watch for Steve so he can time his wayward runs once again and get on our way. 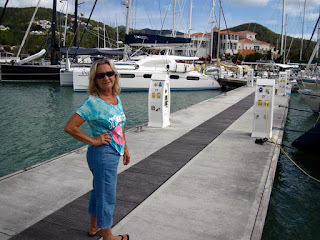 I kept telling Maria is was only a 3 hour sail, hmmm, to the north end of Antigua and a rumored great anchorage. Well, luckily, 3.5 hours later, we found Great Bird Island in an area that looked exactly like the Bahamas: Colorful water, uncrowded anchorages and a deserted island awaited us. Wow. 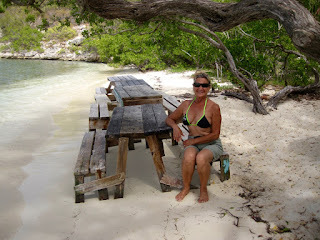 We wandered the island on white sand beaches and waded in the water looking for shells. Now this is how sailing in the Caribbean should be, we both thought. 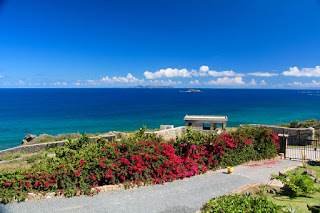 We had never ventured on this coast of Antigua and wondered why it took us so long. A party catamaran full of party people showed up and swam to shore on our private island but they didn’t stay long before leaving us in solitude once again. 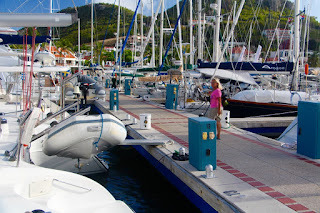 This weekend, as you are enjoying life on land, Maria and I will be sailing overnight to Sint Maarten. Hopefully the stars will guide us there and the squalls will stay away. 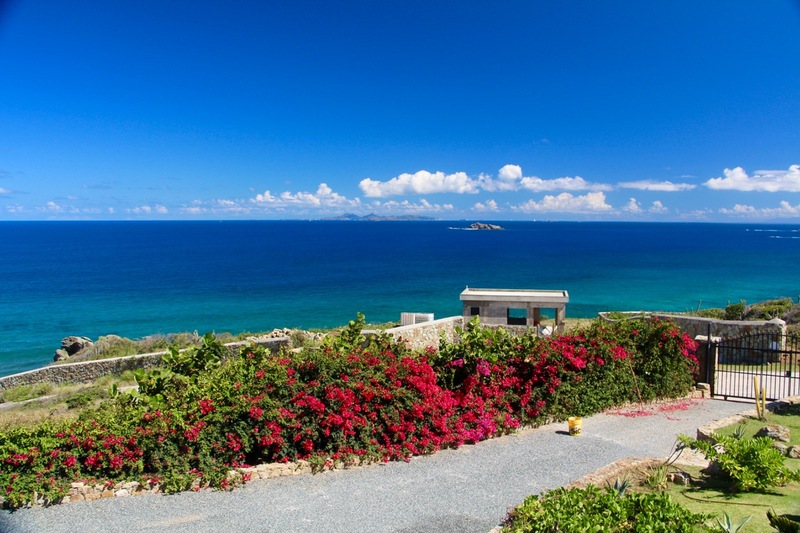 Give us a thought or two as you enjoy your restful slumber, knowing we are rocking and rolling in the warm Caribbean breezes far away from land.